We start the twenty-four hour process with fresh, untrimmed back ribs. Each rib is measured and trimmed by hand, allowing for more meat and therefore more flavour with every bite. After trimming, the racks are then left to marinate over night. 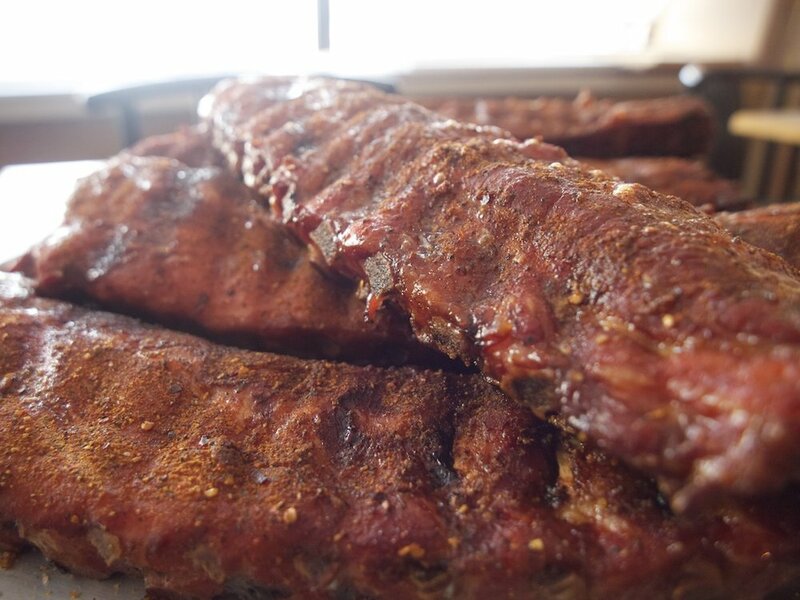 From the marinate, each rack receives a generous coating of our own dry rub. Ricks dry rub consists of eight spices and herbs, each one designed to compliment each other, resulting in a beautiful blend of rib heaven. The ribs are then smoked low and slow for about four hours, using a mix of hickory and fruit. But we’re not done yet. After smoking we add a final step, which is a Ricks secret. This step adds a perfect injection of flavour that really separates Ricks ribs from all others. The last step is to finish the ribs on the grill with a thin glazing of Rick’s Sweet and Spicy sauce or Rick’s Hickory sauce. After all that, you end up with a rib that is simply fantastic. Each bite releasing, first the sweetness of the glaze, followed by the moisture of the marinate, ending in a slow build up from the dry rub. Each rack is served with Ricks two signature sauces. Hickory and Sweet and Spicy.